Minimalism. What does it mean to you? Does it say white walls, wooden floors and wide-open French windows? 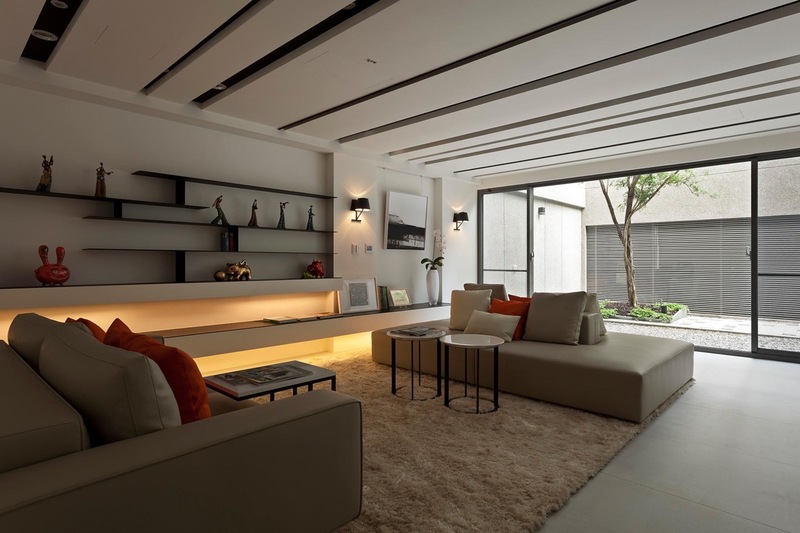 Does it look like block sofas, strong architecture, muted colours and patterning? 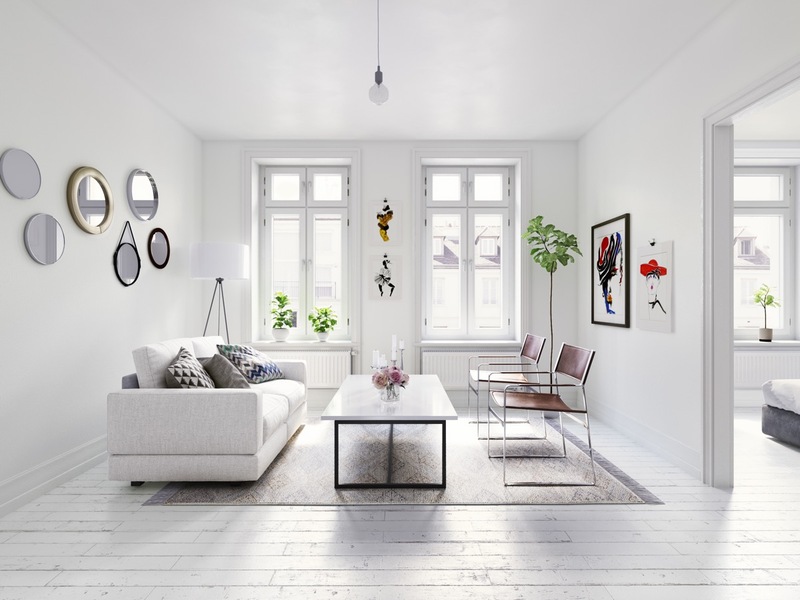 Minimalism doesn’t have to mean choosing simple, boring or inexpensive furniture and accessories. 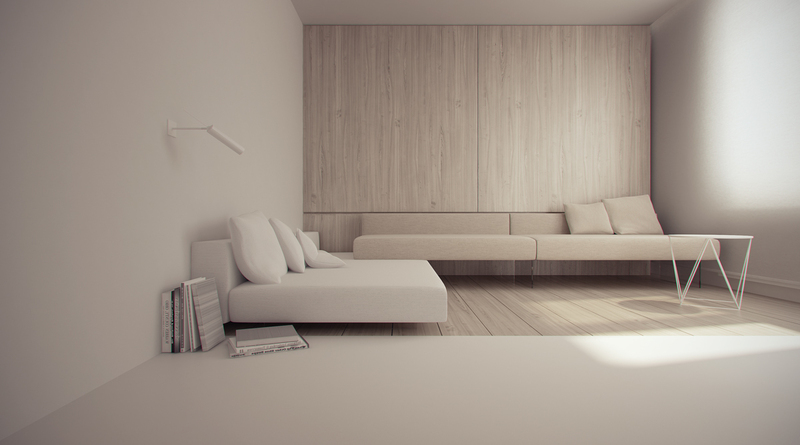 Simply meaning ‘less is more’, minimalism can help focus your room on your desired mood or theme. 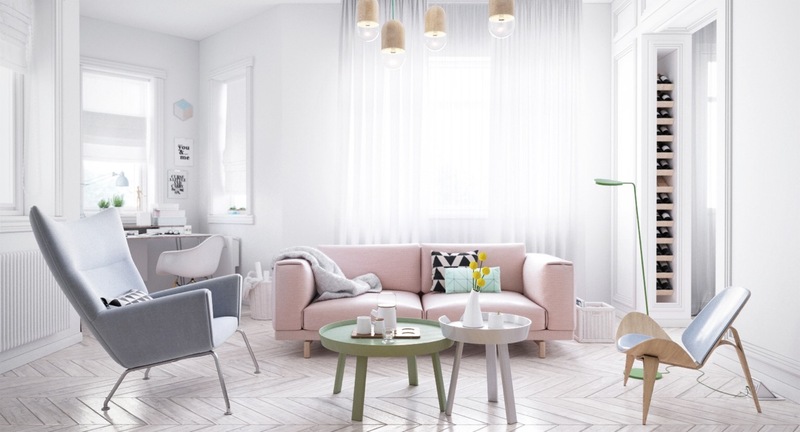 Paint it pretty, with a row of pink couches set upon a white floor. Make it dramatic, with a striking beige and white line halving your room in two. 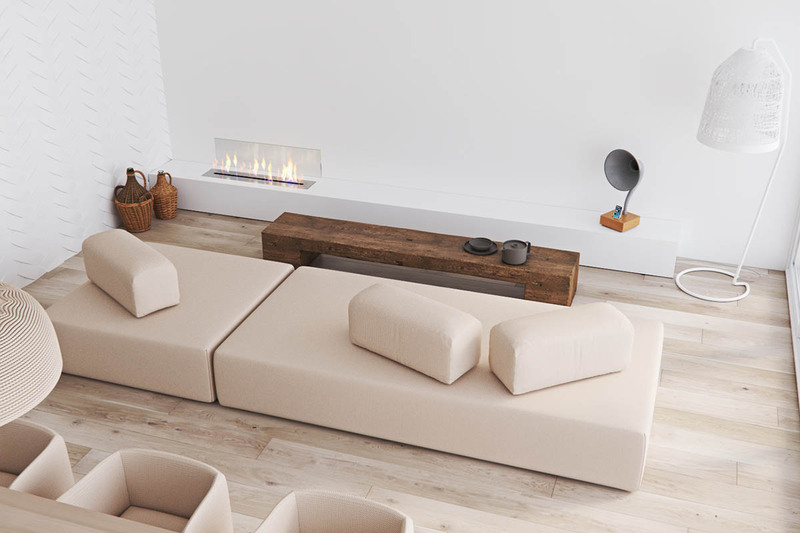 Find substance in simplicity, with our top 40 gorgeous looks for minimalist living rooms and interiors. White, eggshell and wood need not be boring. Making frames on the balcony and bookcase beyond, wood lets in light both from the outside world and LEDs within. 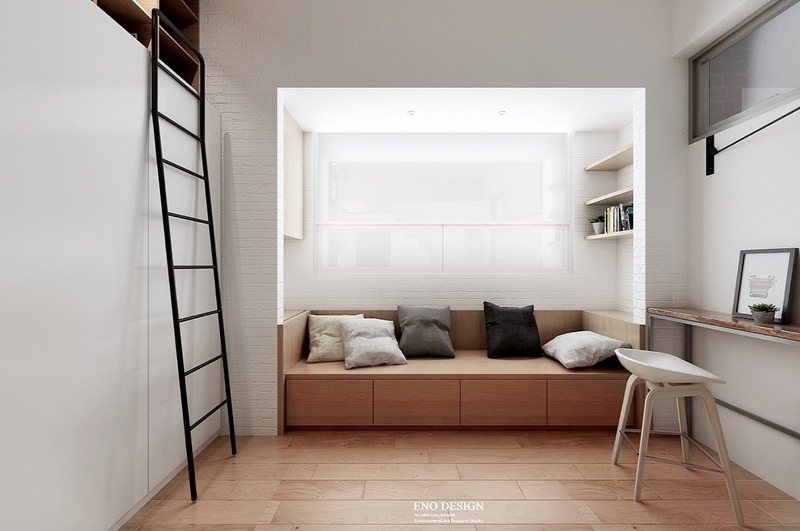 Dining cubby chairs mirror their lines with their legs, while simple futon sofas provide a place to rest. See more of this interior here. Want a little more contrast? These beige futon sofas, ottomans and chairs provide warmth beside a gramophone, baskets and log bench in darker shades. An electric fire brightens the atmosphere. Let a line of LEDs do the talking. 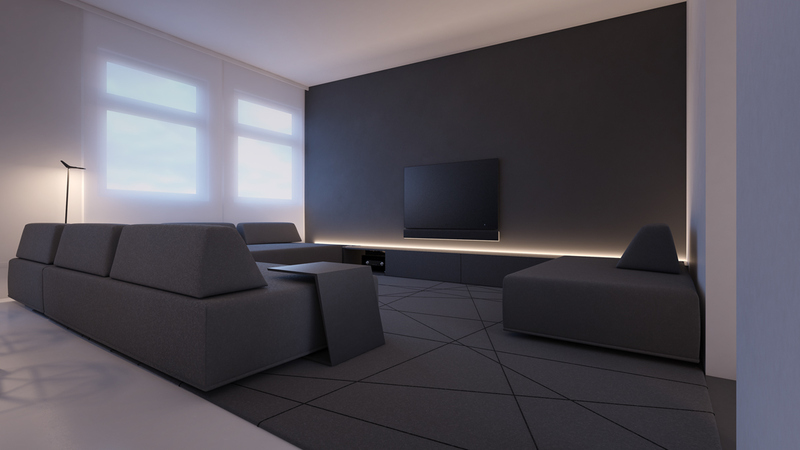 Bathed in moody charcoal, the feature wall, modern sofa and wide-span rug of this interior are centred on a below-TV line of lights. The rug’s geometric patterning ties in the look. Halve your interior. This platform-raised design features pure white on one side, a room in mushroom on the other. 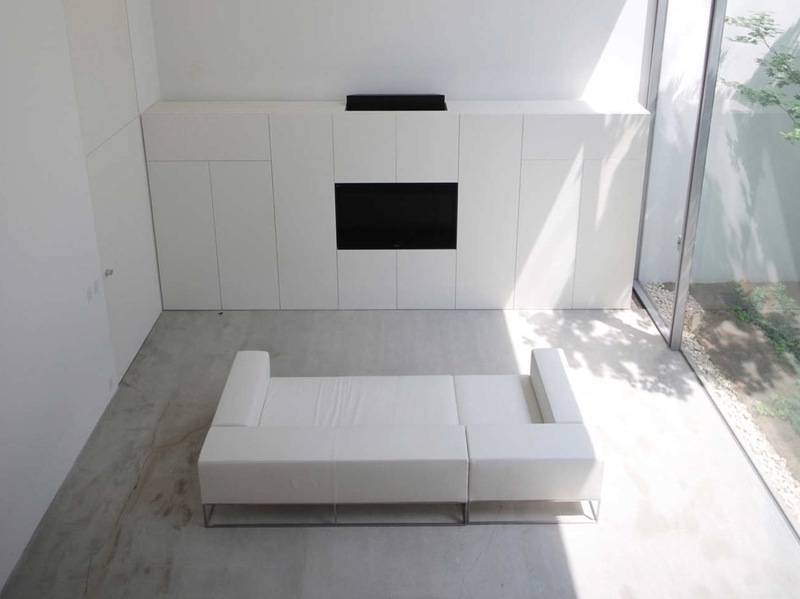 Simple block furniture and comma-shaped cushions make colouring the hero. 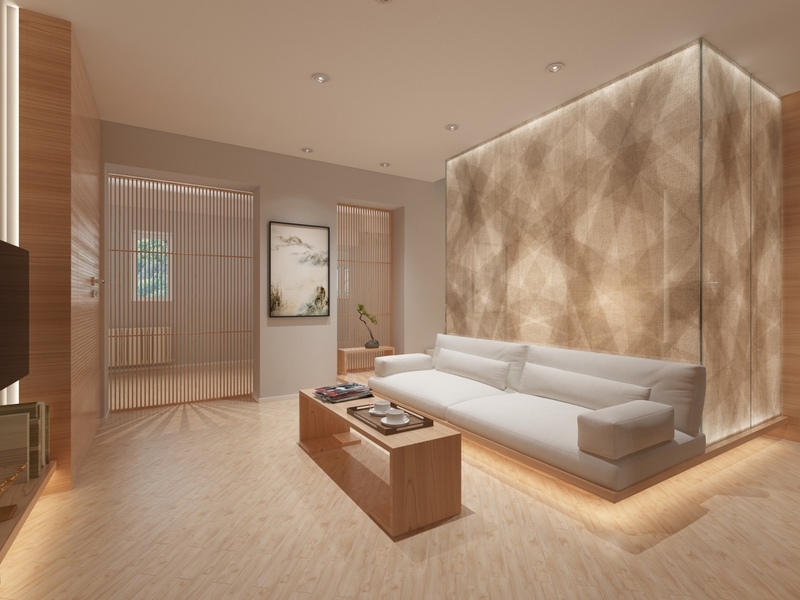 Subtle texturing can make your lounge come alive. Alternating wood grains in the cabinets and floor mix with a spindly metal modern coffee table and plush sofa seating, creating areas that differ only ever so slightly. 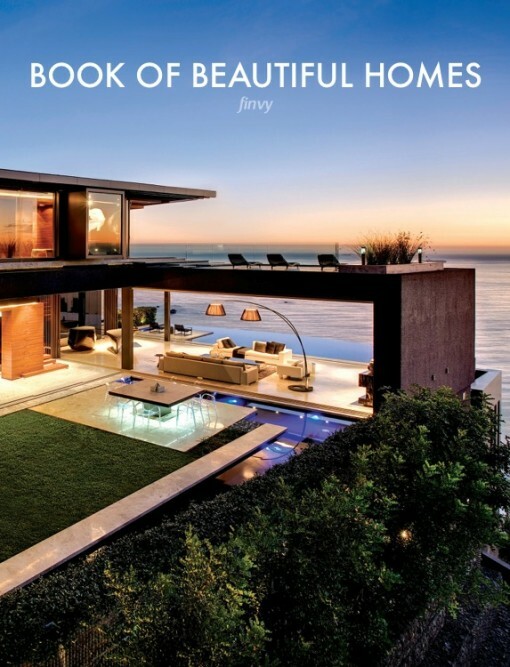 A stack of books adds a finishing touch. Take your living room up a level. 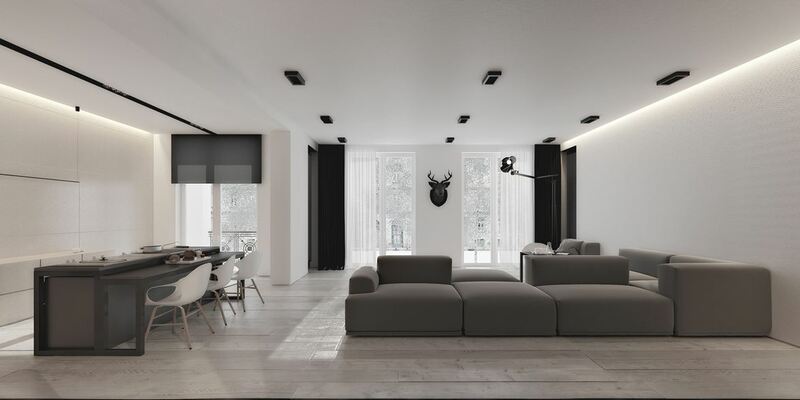 The architectural lines of this black, white and grey interior ensure the eye is distracted while the hues remain simple. 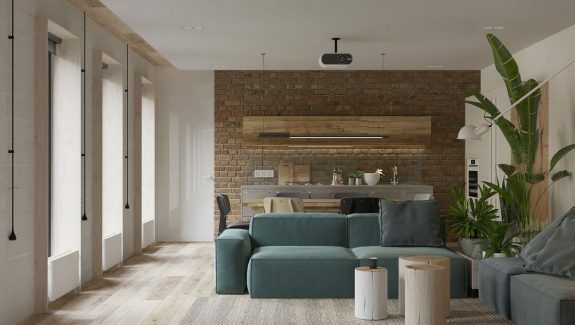 Exposed brick walls, a cotton couch and wooden flooring create difference with texture. See the complete interior here. Not sure how to house your kitchen and lounge? Take a cue from this shared space. 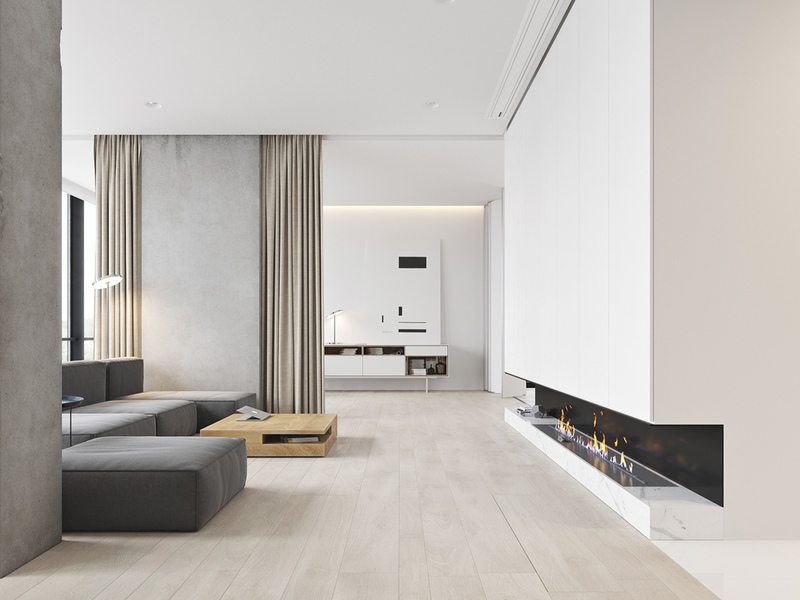 Using light grey flooring to connect the two, the lounge remains white, bright and rectangular; the kitchen bathed in concrete grey. Under-cabinet LEDs keep the kitchen’s light breathing, while a black dining set harks to the lounge with a vase of white florals. Want to introduce more colour? 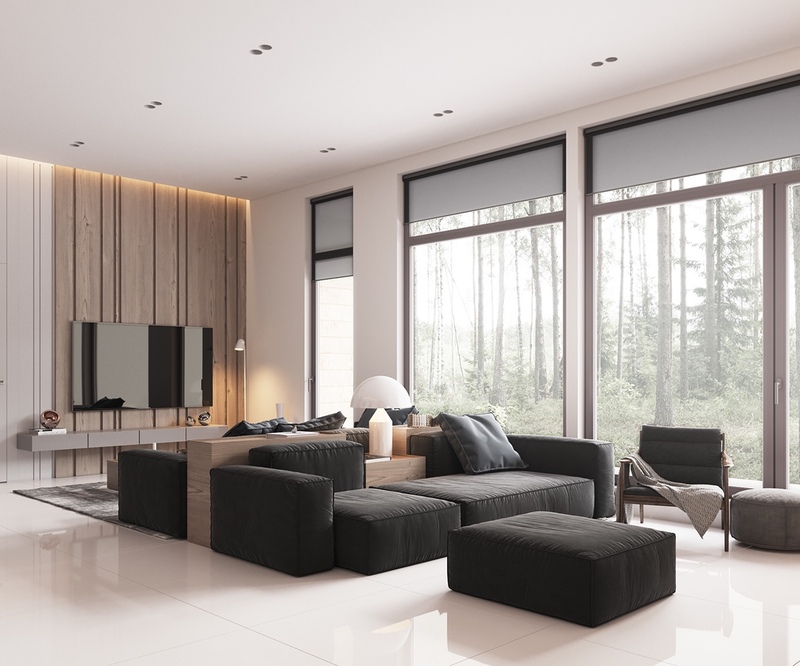 This minimalist space ties white, black, grey and taupe together for an ultra-modern look. A light-infused balcony brings brightness to the home, while lines of ceiling lights and a faux deer head add character. Play with shape and form. The rectangular lines of this lounge’s sofa, rug and cabinets meet three nesting coffee tables spheres and Chinese lantern lights. Teardrop shapes shine through in glowing lightbulbs and sprig-bearing vases. 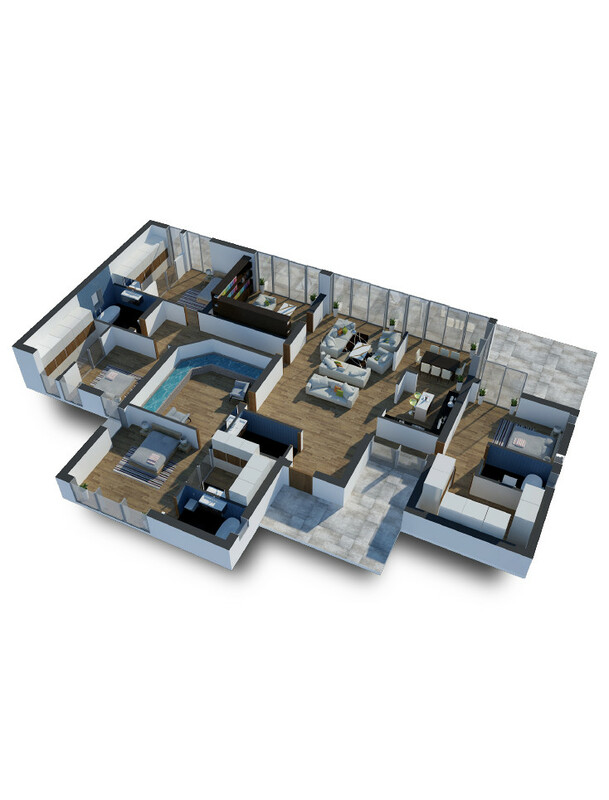 Designing for an apartment? 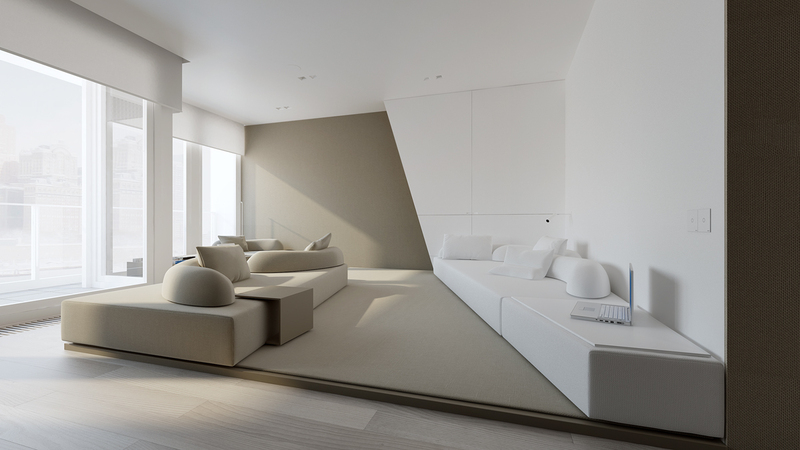 Minimalist hues can add the illusion of space. 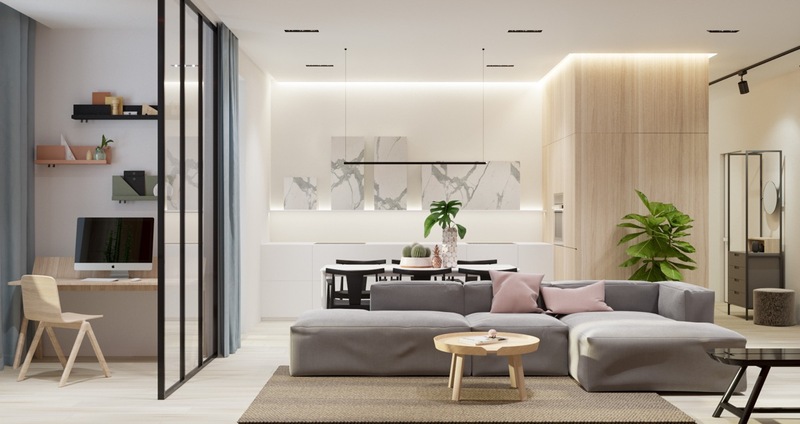 These light greys, whites and woods are framed by lines between wall cabinets, ceiling contours and wooden floor panelling. Black joins the party in a flat screen TV and sliding door frames, as an Eames Bird replica keeps watch. Create more room by hollowing out furniture. 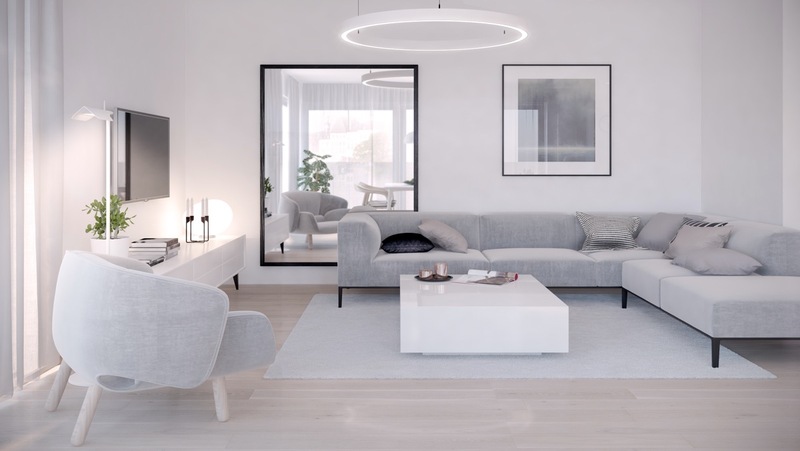 This minimalist living room does it well, with lifted sofas and cabinets, a white ringed chandelier, and an opposing mirror reflecting the view. Muted colouring allows space for potted greenery. Make your living room dramatic. This décor dominates with striking black camera lights, a TV, filigree light pendants and a rock-star leather couch. See more of this film-set style interior here. 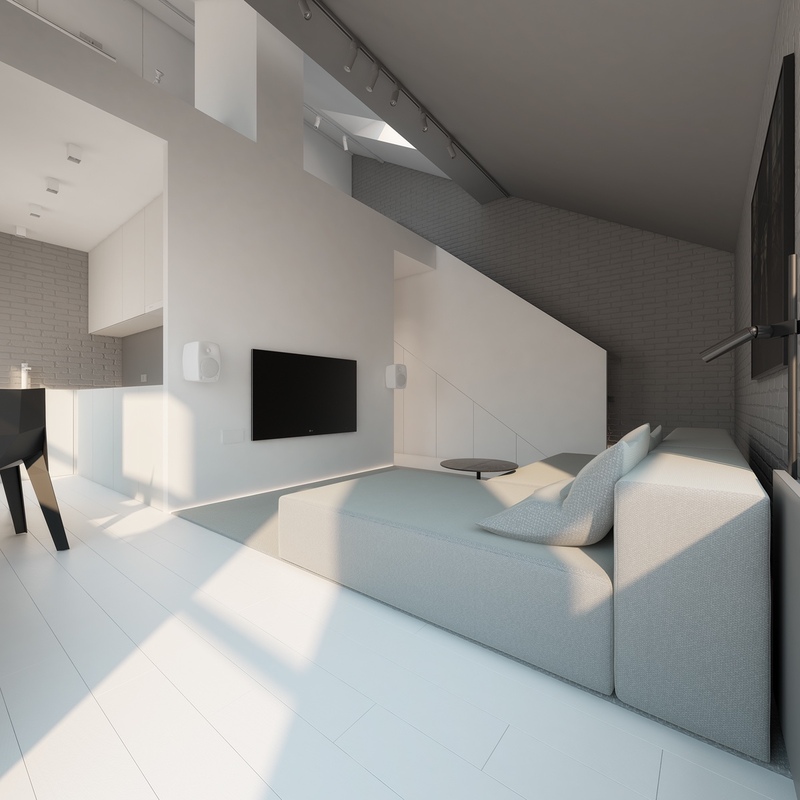 Want a space that’s purely monochrome? 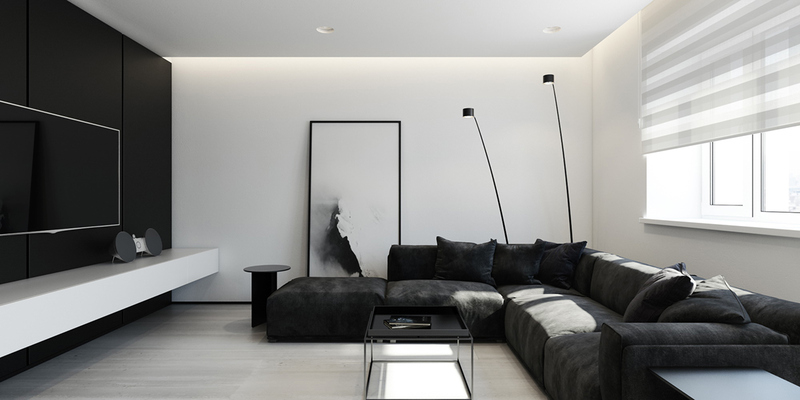 The stark black wall, suede L-sofa and stencilled coffee table of this bachelor pad look less moody beside large panels of white. 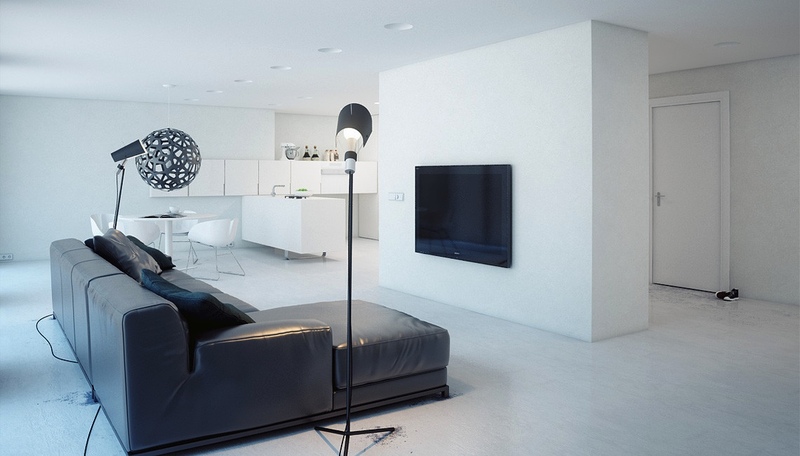 Two unique floor lamps provide height beside an artwork. Worried your black and white living room might look too extreme? 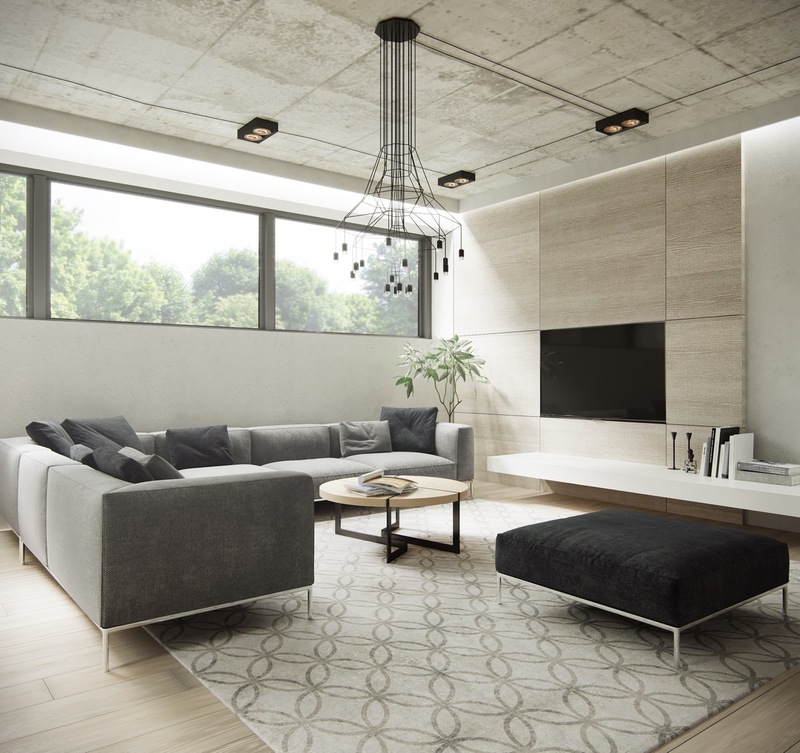 Mix black with navy ceilings, rugs and curtains, as per this interesting interior. Paired with black hover lights, joinery and artwork, the room’s dark panels are brightened beside walls in white and a burst of green fernery. Make scenery a key part of your interior. The wide open windows and sheer chiffon curtaining of this monochrome space open up a wall of hanging creepers and manicured hedges. Metallics in circular pendants and a sofa add flair, while a tiled floor in marble lines it with luxury. Stick to your building blocks. 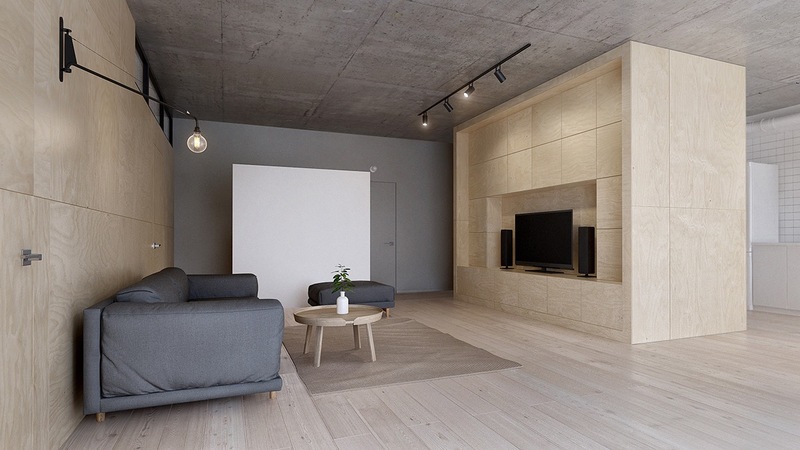 Based on a concrete floor, the only feature of this minimalist living room is a TV in black. Black and white photographs can make the minimalist human. 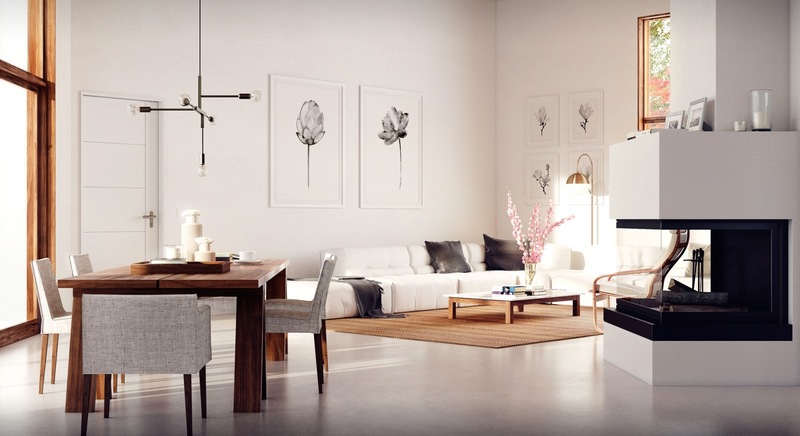 Set on a stark white wall and painted floor, three captured faces gesture amidst a ruffled rug, reclined seating and unique coffee tables. Try something more Scandinavian. A light wooden floor, muted seating and tables afford visual space for hipster monochrome prints and some jazzy lime cushions. Looking for more character? This funky lounge is a great example of pop art minimalism. 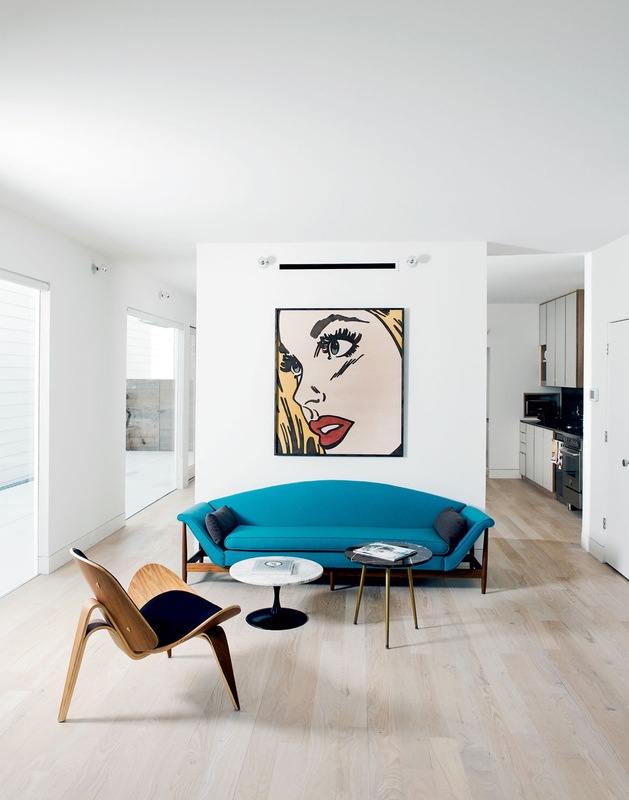 Surrounded by white walls and simple wooden floors, a retro cartoon, 50’s swing back and bright turquoise couch provide visual stimuli. Think along finer lines. A myriad of small white cubby holes meet a stencil chandelier and thin-framed artworks, creating patterns that coalesce, not clash. A white fluffy rug and luscious-leaved tree provide a bit more substance. Designing for men? Think more texturing, less colour. 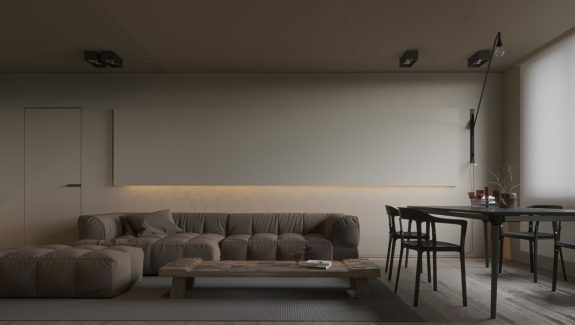 Covering a TV feature wall, floor and industrial ceiling, this room’s plywood and concrete provide a minimalist base for furniture in black and grey. 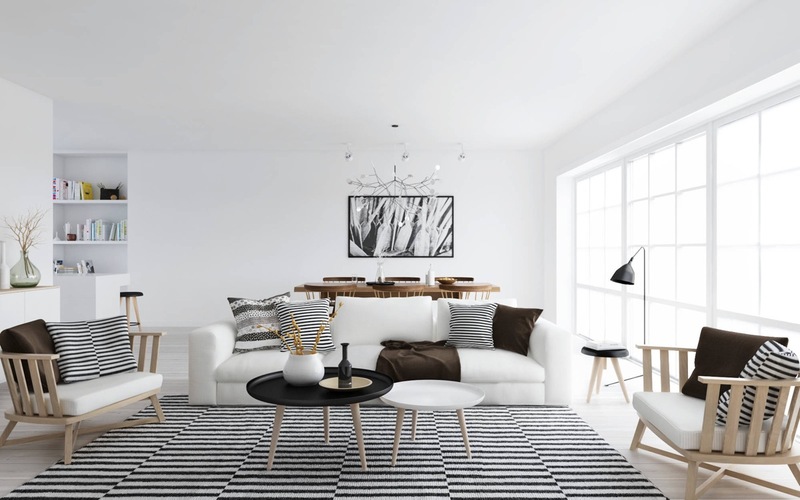 Black and white rooms can look ever so trendy. Striping a rug and cushions in striking monochrome lines, this lounge seamlessly merges Scandinavian-style chairs with abstract prints and silver spider chandeliers. Ever heard of Soviet minimalism? This apartment owns the look, with a stark feature wall and illustrative painted round. A warm brown chair and bottle of wine offer cordial invitation. Love the look of large blocks? Place them in your living room amidst large wooden panes, like in this minimalist space where lines of camera lights run free. Silver satin furniture adds contrast. Create your own safe haven. Lined with plaster and brick in white, a booth seat and flooring in timber, this minimalist retreat offers a cozy place to turn the pages. An adventurous ladder and one-plank wall shelves create decoration. 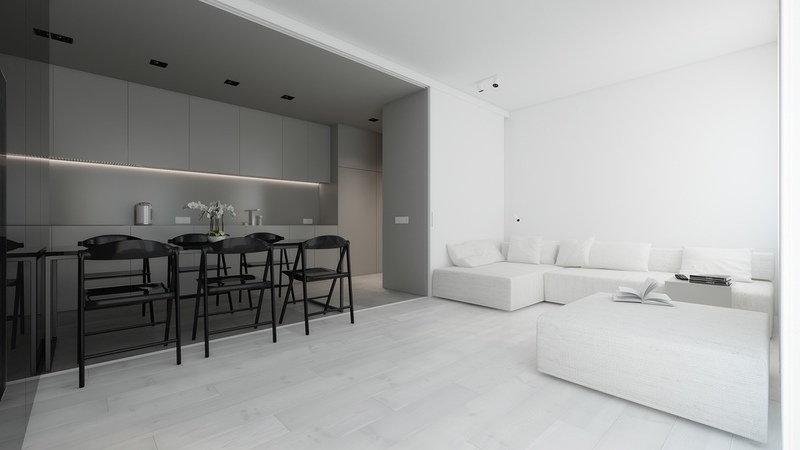 Minimalism can create the ever-so-classy. Against a backdrop of white and wood, interior curtains and block seating are warmed beside an inset fire. Make your ceiling your feature. 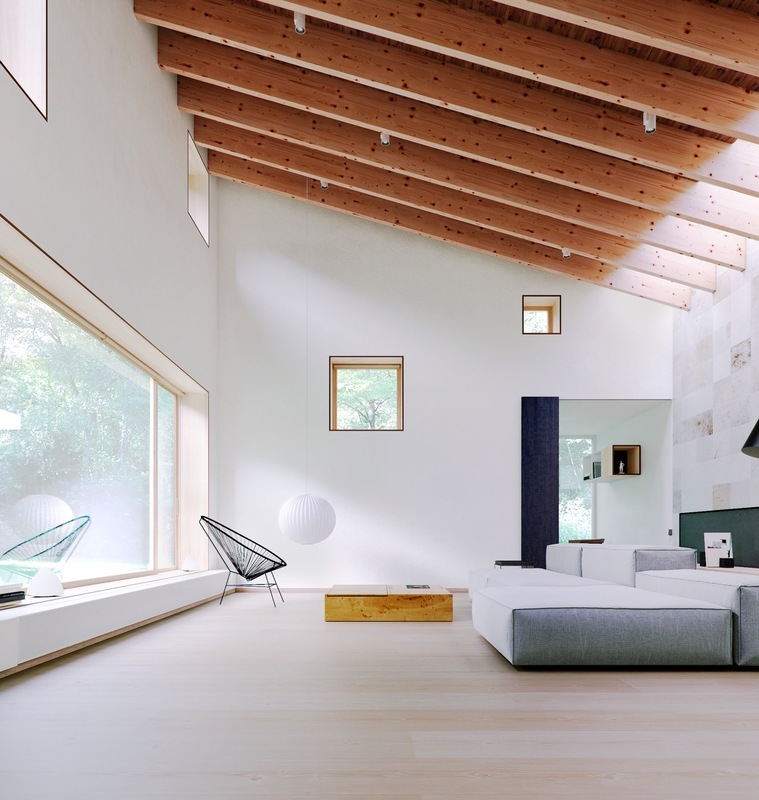 The sloped rafters of this white space look down upon a low Chinese lantern, wide open window and block sofas in grey. A couple of window squares keep viewers’ interest. Dusty pink still has credence in minimalism. 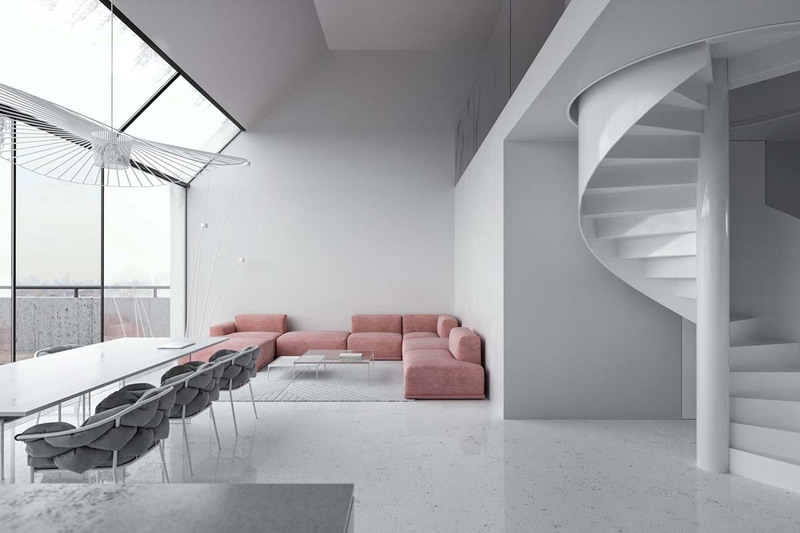 Turreted staircases play with speckled stone flooring and large Japanese windows in this modern apartment, drawn in the corner by a blushing set of sofas. Prefer a dose of green? Pea green steals the limelight in this room, a minimalist concoction of grey inset shelving, wooden panelling and creeping hover lights. A spot of pink provides a table. 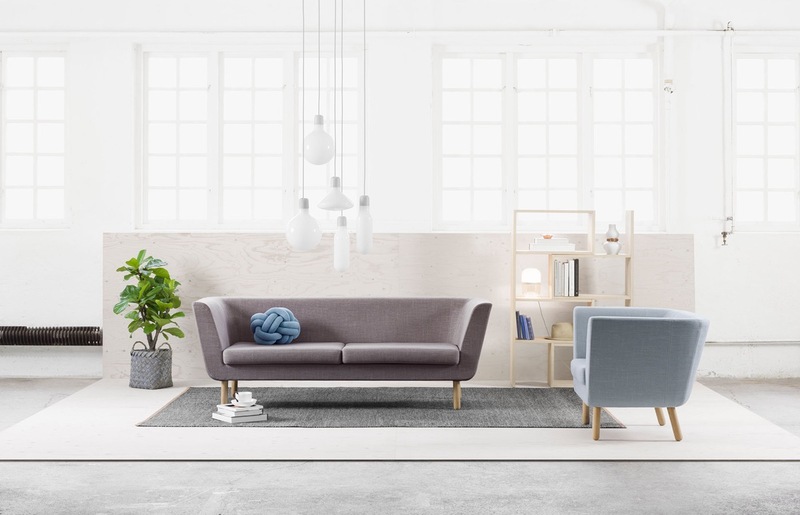 A minimalist lounge can still harbour accessories. 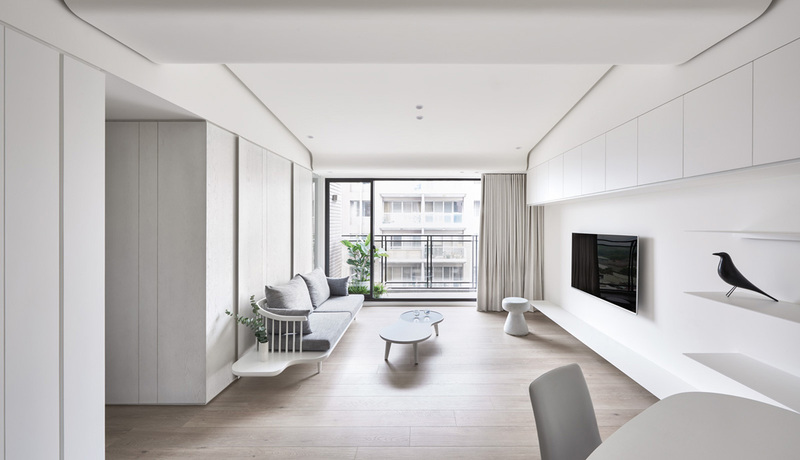 A white and wood canvas provides space for potted greenery, marbled artwork and differently-coloured cushions and mats. Make it pretty in pastel. The pinks, blues and greens of this lounge create a dreamy aura against a backing in chiffon. A thin line of unique wine storage shelves keep a few tipples for later. Want it more structured? Have less chairs and tables, and make the background pure white. In this minimalist design, a Fiddle Leaf Fig and bevy of white pendants complete the picture. Love mirrors? 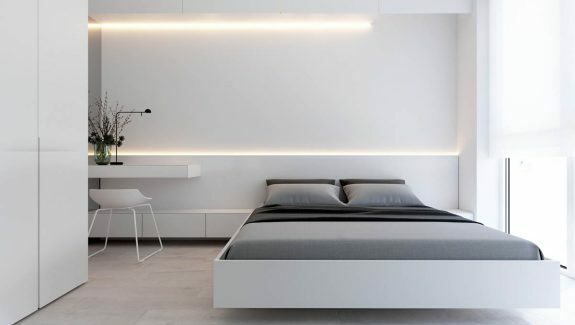 This minimalist Scandinavian bedroom makes them a feature on its wall. 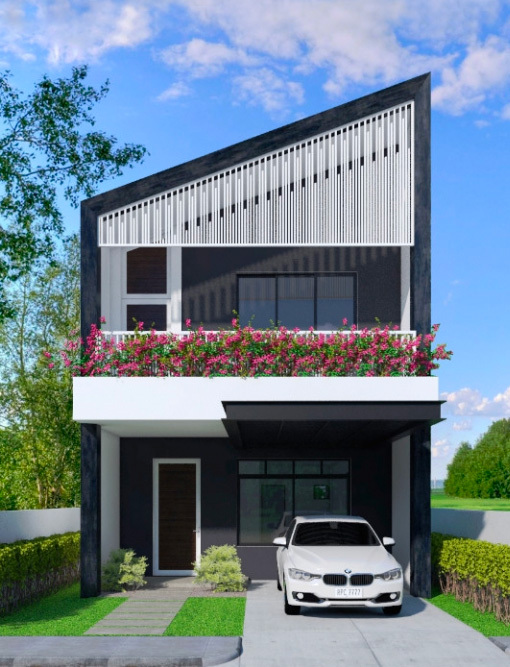 Add in French windows, cubby seats and an audience of indoor house plants, and you have a magazine-ready interior that’s super easy to maintain. Let darker furniture take the stage. Upon a setting of pure white, an L-shaped sofa, black and wooden stools and splayed fan seat sit under a sky of black lights. Make it a little warmer. Tan colours a wooden window frame, rug and dining table, making a monochrome interior a space for all the family. A lightly-patterned wallpaper can add subtle flavour. 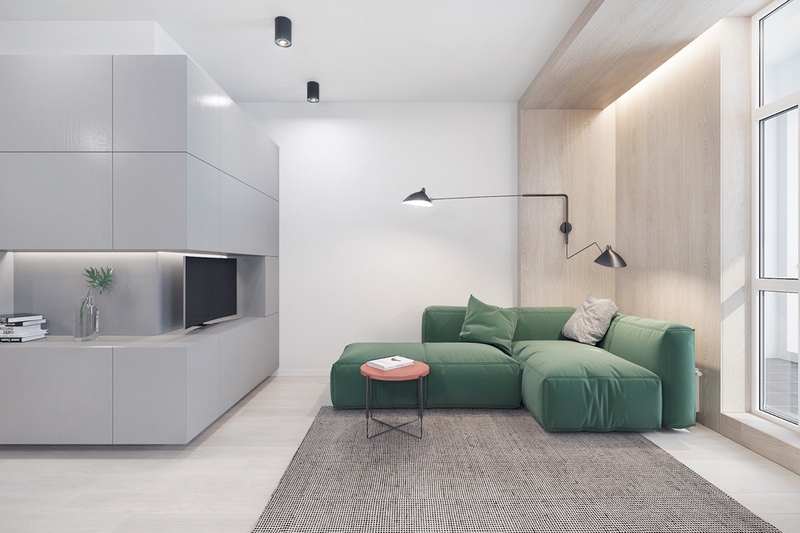 This light grey wall interests beside a striking black TV panel and several shades of fabric. 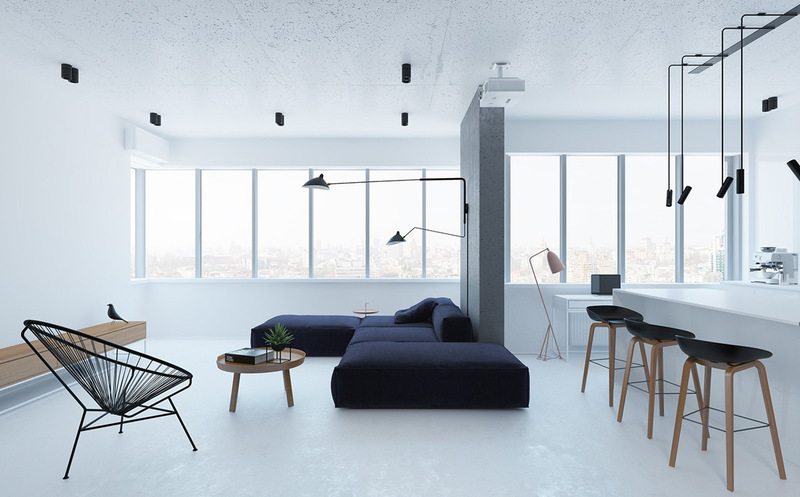 Minimalist interiors can work by height. This lounge keeps its furniture low, with its charcoal block seating, wooden partition, plush ottomans and flat-screen TV. A forest view does the talking. 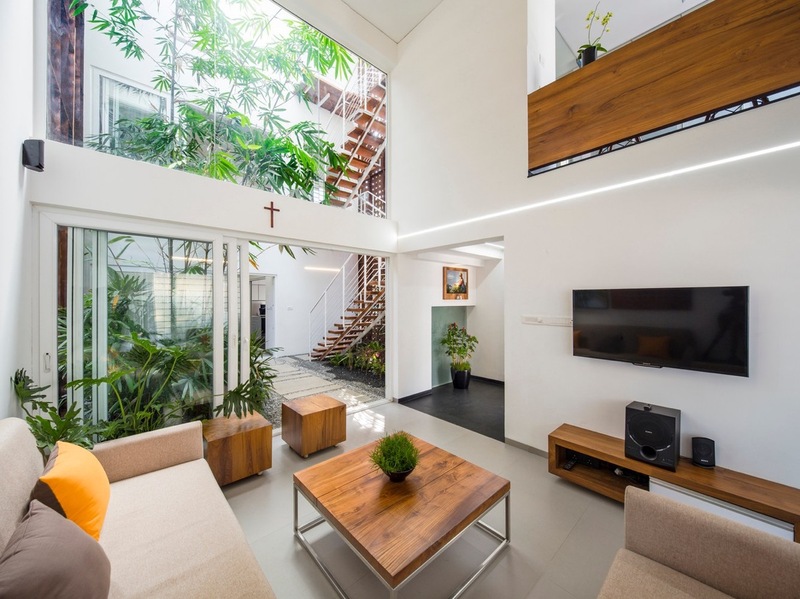 Like the look of this minimalist tropical living room? Recreate it for yourself, by using warm wooden furniture, a range of wide windows and a planted jungle outside. A bright orange cushion and indoor pots bring cohesion. The right lighting can make the minimalist brilliant. Indoor lights project patterns on an interior cube, while outside windows shine through thin wooden partitions. Common beige and eggshell hues ensure the space isn’t busy. Capture the elegance of Asia. This minimalist modern Asian living room uses pops of red to draw eyes to relaxed block seating, clever black shelving and a hearth of LEDs. A similarly-lined ceiling injects beauty in architecture.